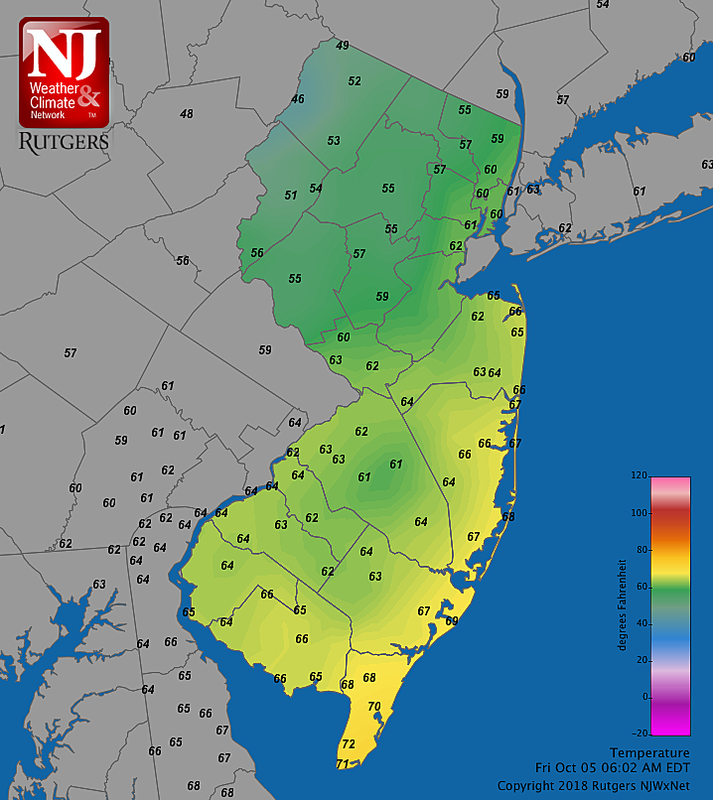 As I write this forecast, I'm watching the NJ temperature map transition from "yellow" (70s) to "blue" (40s), as cooler air returns. Yes, it's about to feel like fall again. But this cooldown is only temporary. Friday night will see low temperatures in the mid to upper 50s. Yes, that's cool — but it's actually above seasonal norms for early October (48 to 52 degrees). Patchy fog and drizzle will be possible overnight. My only real weather concern for the Columbus Day weekend is that fog and drizzle, which may linger into Saturday. That would make for a "blah" first half of the day. A persistent on-shore flow (i.e. northeasterly wind) will keep temperatures cool and partial cloudiness in place Saturday. (Yes, that forecast trends in the negative direction from what I said earlier this weekend.) High temperatures will be in the lower 70s. As long as we see some sun, it'll be a decent autumn day. By Sunday, we'll flip back to southwesterly winds. And the floodgates to warmth shall return! With partly sunny skies, high temps should soar into the lower 80s Sunday afternoon for all but far northern and coastal NJ. Columbus Day Monday will end up a few degrees cooler, closer to 80 degrees, as clouds thicken up. An isolated shower or thunderstorm appears possible Monday afternoon. Both Tuesday and Wednesday will continue the dry weather trend, with above-normal temperatures generally in the lower 80s. Our next substantial rain threat won't arrive until Thursday-Friday. That cold front will likely drag a line of thunderstorms through New Jersey before cooling us down significantly. Our first frost of the season (for NW NJ, at least) is probably about 8 to 10 days away. Remember what I said: the first half of October looks mostly warm. The second half of October could be a very different story.